So says Lizzie Harper, a natural history illustrator who has been practising her craft for over fifteen years, working as a freelance illustrator upon commission. Apart from doing scientific illustrations, Harper also produces beautiful graphic designs inspired by natural history – cards with flower-bedecked butterflies, postage stamps with intricate plant illustrations, gardening instruction guides and much, much more. She also really likes bugs. 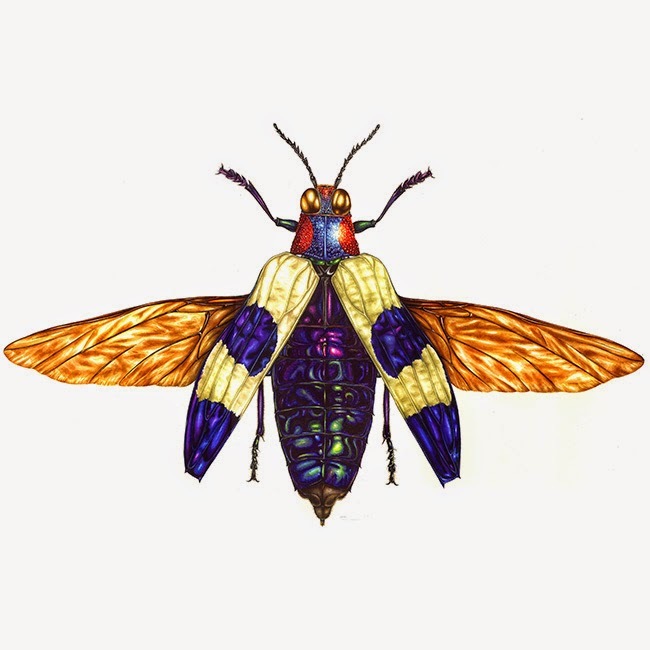 While I’m not much of an insect fan myself, Lizzie Harper’s touch makes them remarkably pretty, and is a wonderful example of the stunning variety of colour and iridescence found in the insect world. It is also necessary to understand the anatomy of your subjects. Such as this recent bug anatomy guide on Lizzie’s blog. As you can see, being good at drawing and painting is just one aspect of being a good natural science illustrator. Keeping boxes of dead things is vital, too. Please visit Lizzie’s image library for many more stunning images of beetles, and other things, too!